This is the third in a series of interviews with our amazing volunteers. These are ordinary Members of Doula UK, who do extraordinary work, often very much behind the scenes, to run our organisation. How long have you been a doula? What was your path to doulaing? I have always been interested in midwifery since I had my first daughter at the age of sixteen, twenty years ago. I was finally set to do the midwifery degree two years ago, and when I attended the open day at the university the course tutor suggested I become a doula first for birth experience. At around the same time my sister had asked me to be her birth partner at the birth of her third baby. It was the most incredible experience, a beautiful home birth, full moon outside and my niece was born en caul. The midwife who attended my nieces birth suggested I become a doula too … so I found a doula training that happened to be in Brighton a few months later, in April 2016. At the time I was also working full time as a Community Therapist Assistant in the NHS. I loved the job I had but it was long hours I was still feeding my then two year old daughter, and it was exhausting. So a few months after my doula training I decided to take the plunge into doulaing and leave my secure full time job. I found a job as a dog walker for a local company to help financially when I wouldn’t be earning from doulaing, plus the job would be a bit more flexible for when I had births to attend. My partner is a full time archaeology student so it was a bit of a gamble for me to take the leap, especially with four children. I have never looked back! I can incorporate so many of my interests and passions, I meet amazing people, it is a really amazing job. I have always worked in care since I was 1eighteen; I worked in home care, a hospice, then a HIV centre. I really find my work experience and training fits doulaing really well, as do my interests, in herbalism, and alternative therapies. I often feel like my whole life has led me to this, like it was meant to be in so many ways. When did you join Doula UK? Please tell us about your home life…. I live with my husband and four children (ages 20, 14, nine and three), my son in law, three cats, guinea pigs, stick insects… It is a crazy house! I love it though. What does an average week look like to you? My weeks vary, as I am a dog walker, studying sacred drum healing, druid celebrancy, as well as doulaing, and being a mama of four. This week I have walked two dogs every morning. I spent Monday morning studying and attended a beautiful home birth in the evening. Tuesday I met up with a mama for an antenatal session and drum healing, as well as doing things with my children. Wednesday I had a free day with my daughters (one of whom wasn’t too well), plus I spent time researching for a birth client. Today I have spent the morning writing and researching for my voluntary Doula UK Rep role, which I share with another doula. I also spoke with my Doula UK Mentor about doing postnatal work. I am home again with an unwell daughter, and am doing a drum healing session with a mama this evening. Friday I am meeting a mama for another drum session and antenatal chat, I also have an interview with a new potential client. I am back on call too for another birth this week too. Saturday and Sunday I have more dog walks, Ill be spending time with my family, and Sunday I have a massage booked for myself. I am also around all week in case my client who gave birth Monday needs me. When did you first volunteer for Doula UK and what volunteer role/s do you have now? I started in August 2016. 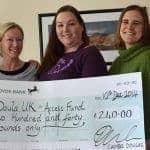 I am a Doula UK Rep for Sussex, a role I share with another doula, Gemma Harvey. How many hours a week do you typically spend on Doula UK work? I would say on average about two hours a week. The job share works really well for me because we take it turns and work a month each on the bigger tasks. Gemma and I meet once a month to talk about the role, events to arrange and emails etc. What do you enjoy about the role, and what are the challenges? I love the volunteer role because it keeps me busy, I meet a lot of amazing doulas and other birth professionals. The challenges are keeping up with the work load I feel I could always do more. Do you have a motto or favourite quotation? My most used two lines to my clients are ‘trust in your body and let go’ and ‘birth is not just a journey of the body, it is a journey of the soul’. You can read Eva’s doula profile here.